Private Equity Vs. Venture Capital, Difference between PE and VC: Better? Finance Careers » Private Equity Careers » Private Equity vs Venture Capital – Which One Is Better? Private Equity vs Venture Capital – Which One Is Better? Amongst the newest forms of investment vehicles available for rich individuals are Private Equity and Venture Capital. However, it always seems to be a hot topic of discussion about Private Equity vs. Venture Capital and which one is better. A private equity investment is made by investor/s as per goals, preferences and investment strategies of the firm or individual investor. In general private equity provides working capital to the target company to cultivate expansion, invest in new-product development, or restructuring of the company. One of the most common investment strategies in private equity is called venture capital investment or growth capital. Venture capital (VC) is a strategy where financial assistance is provided to companies that are at the initial stages of their lives and have the potential to deliver supernormal returns justifying the investments made in them. The venture capital fund earns money by acquiring equity in lieu of the investment it makes in the company. Prime candidates usually are the ones with some novel technology or a unique business model in relatively newer sectors. A venture capital fund does its investment after the initial round of funding is done. The investments are done with a view of generating supernormal returns through events, such as an Initial Public Offering or sale of the target company to an existing bidder, which unlocks the company's true value. Private equity investments are not new, in fact, it has been in existence for almost a century and was the domain of wealthy individuals and families. Some of the most famous families like the Wallenbergs, Vanderbilts, Whitneys, Rockefellers, and Warburgs could be termed as pioneer venture capitalists. For example, Laurance S. Rockefeller helped finance the creation of both Eastern Air Lines and Douglas Aircraft in 1938. Eric M. Warburg founded E.M. Warburg & Co. in 1938, which was the forerunner to the current entity of Warburg Pincus, one of the largest private equity funds with investments in both leveraged buyouts and venture capital. The Wallenberg family created Investor AB in 1916 in Sweden and acted like venture capitalists for marquee Swedish companies such as ABB, Atlas Copco, Ericsson, to name a few. The confusion between the activities arises as the terms are often used interchangeably even by those who are practitioners of this form of investment. Both VC and PE are in the business of buying cheap and selling dear. However the approach to this challenge is what fundamentally differentiates the two entities. Private equity firms usually take interest in a pre-existing enterprise with established products and having positive operating cash flows. The PE firms try and restructure aspects of company which will optimize the company's financial performance. If the work comes out in a proper fashion then Private Equity has demonstrated its ability to save poorly-performing companies from bankruptcy and turn them into viable enterprises. The venture capital process is usually much messier. Often, you start with nothing more than a brilliant idea and the people behind it and work on realization of the next big idea. To make things easier, we can say that a PE fund will polish a rough diamond, whereas a VC firm would make investments in land parcels hoping or the next diamond mine to be in one of its investments. 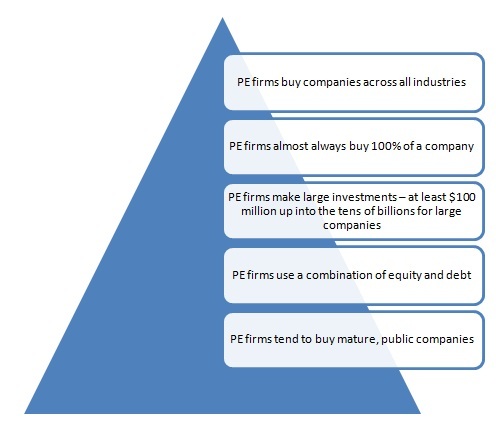 Both PE firms and VCs invest in companies and make money by exiting – selling their investments. It is an oversimplification that private equity firms simply acquire companies, make lives of employees miserable, saddle the company's balance sheet with debt, and then sell the company for a fat profit without doing anything substantial. PE firms are not known to be actively involved in fixing a company’s operations, but they certainly do put in a lot of hard yards to improve overall management of the company and find ways to expand – especially when it’s a recession and there’s not much buying and selling of large companies. Venture capitalists on the other hand, get involved with operational nitty-gritty of the firm if they feel that the firm in question is wavering on focus, the stage of the company, and how much the current owners wants them to be involved. 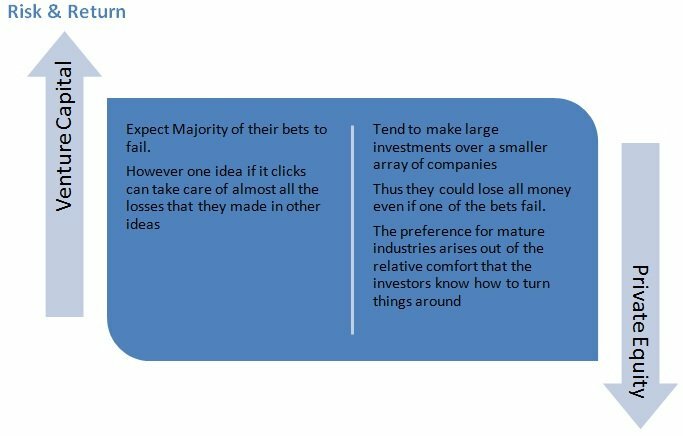 Although there has been lot of talk, in reality returns in both industries are much lower than what investors claim to achieve. 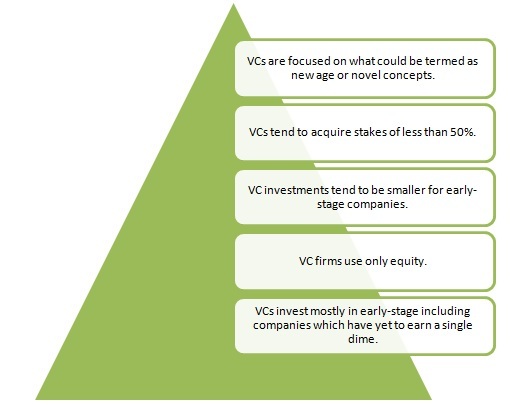 Most VCs and PE firms target 20% returns, but there are plethora of VCs who have given only 10% returns over a 5-year cycle and many pension funds that invested in PE firms are living with sub par performance. One difference is that in both the models it is the firms at the top of the heap which generate the returns. The reason being that the best deals in case of both the PE and VC companies almost always go to the top firms. Private equity firms focus on roping in former investment banking analysts as the modeling and due diligence work is almost in line with transactions in banking. Non I-Banking people also get into private equity firms if they have good operational knowledge or have very good contacts in the industry of focus for the private equity fund. Venture Capital firms, because of their very nature of business tend to attract a more diverse mix – you’ll see ex-bankers, consultants, business development people, and even former entrepreneurs. Especially at large PE firms, the work is not much different from investment banking: thus you would be spending a lot of time in Excel valuing companies, looking at financial statements, and conducting due diligence, which are standard I-Banking activities. Additionally you need to coordinate with other entities like accountants, lawyers, bankers, and other PE firms as per the deal's requirements. As you progress from Private Equity to Venture Capital, the work becomes more relationship-driven and less quantitative. Some people may not like activities like cold-calling and the pressure of constantly finding new companies to their liking. To summarize the battle for Private Equity Vs. Venture Capital we may say that if you are number driven person with a passion for making things better, then Private Equity is the place to be. You would enjoy the high that big ticket investments make. However, if you wish to unearth the next big thing and believe that you have it in you to find the next Google, Apple or WhatsApp or something which no one thought would change the world, then Venture Capital would warm the cockles of your heart.